‘Warsaw is full of lost children’ says Jan. Within juvenile fiction, there’s a runaway-orphan sub-genre, those tales of the child removed from parental control and thrown back onto its own resources. For the comfortably loved child reader it provides teasing glimpses of a luring freedom from adult authority figures, with the added frisson of danger and fear at the loss of that safe protection. The first of seven episodes, adapted by CE Webber, was broadcast on Sunday evening, 17:40, 24 November 1957. It follows ‘Circus Boy’ starring Mickey ‘Dolenz’ Braddock (future-Monkee drummer), and ‘Sooty’ with puppeteer Harry Corbett. Produced by Shaun Sutton the serial featured Melvyn Hayes as the sickly Edek. Hayes had already featured in TV’s ‘Quatermass II’ (1955) and as young Victor in ‘The Curse Of Frankenstein’ (1957), but is now best remembered as camp ‘Gloria’ in ‘It Ain’t Half Hot Mum’ (1974-1981). Jan was played by Frazer Hines, a future companion to Patrick Troughton’s ‘Doctor Who’, and an ‘Emmerdale Farm’ regular. Pat Pleasance was Ruth, with Ingrid Sylvester as little Bronia. Patrick Cargill and Shaw Taylor were also there, as a black marketeer and a German officer respectively. I bought the book on the strength of the TV series. But re-reading it now I’d forgotten how the first five chapters – dated to early 1940, concern father Joseph (played on TV by future ‘Doctor Who’ producer Barry Letts). He’s a headmaster whose primary school undergoes forcible Nazification, with Polish textbooks replaced by German language. He defiantly turns the classroom Hitler portrait to the wall, for which he’s snatched by Storm Troopers and incarcerated in the Zakyna prison-camp. As Serraillier explains, this is a real camp given an imaginary name. Actor John Woodnutt – who was, for a while, our near-neighbour in East Yorkshire, could also be seen as a fellow prisoner. Following an elaborately-detailed escape, involving a catapult made from pine twigs and the elastic sides of his boots, it takes him four-and-a-half weeks to tramp all the way to the ruins of Warsaw. 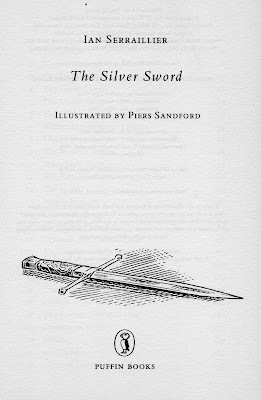 Piers Sandford’s line-drawings reproduced in the 1993 Puffin Modern Classics edition shows the silver sword, a paper-knife Joseph had once birthday gifted to his wife, it’s about five inches long with a brass hilt engraved with a fire-breathing dragon. Joseph rediscovers it in the dynamited rubble of their former family home. His Swiss-born wife – Margrit (Gwen Watford), was forcibly taken as a foreign-worker to Germany. The children, he’s told, are presumably dead. 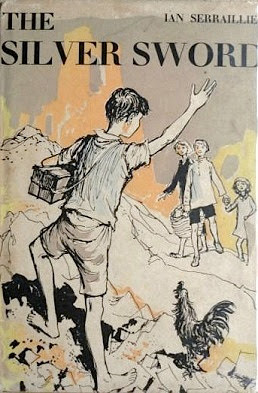 It’s then he encounters ‘a small ragged boy’ with ‘fair wispy hair and unnaturally bright eyes.’ Jan has a wooden box under one arm, and a bony grey kitten under the other. He’s reluctant to even admit his name, and has no surname. ‘I have my grey cat and this box.’ He lives by his wits. But Joseph trades the silver sword for a promise. That if ever the street-wise waif meets the three Balicki children, to tell them that their father Joseph is going to Switzerland to find heir mother. 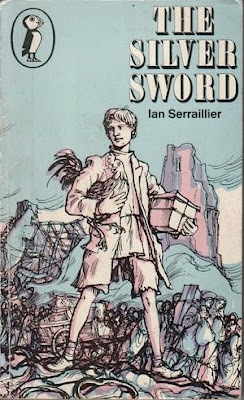 Jan grabs the sword, pops it into his little wooden box, and runs off into the ruins. Yet he returns to help Joseph hop a freight train travelling west. It’s only now that the narrative – composed of economically stripped but wonderfully vivid word-pictures, returns to explain the fate of the children. Serraillier’s prose interrogates the reader about the night of the Storm Troopers – ‘had they taken his wife away? Had they returned and blown up the house with the children in it?’ Then supplies the answers. 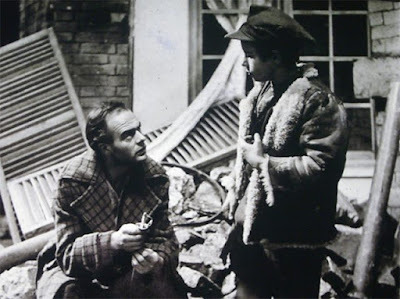 Edek – who was a member of the Boy’s Rifle Brigade at age twelve, had used a gun during the Siege of Warsaw. Now he shoots from his bedroom window, wounding one of the Nazis bundling his struggling mother into a van, and then shoots out the rear tyre. Anticipating reprisals the three children escape through the attic window and perilously cross the adjoining roofs before their home is dynamited. Swiftly and pragmatically they adapt to surviving in the city ruins. Ruth, serious, intelligent and self-assured, starts a school. Edek scavenges, smuggles and thieves from the Nazis, until he’s eventually apprehended. Serraillier’s skill lies in reducing vast global conflict down to a shifting background, through the perspective of a confused war-child. Even the Nazis are shadowy bogey-men to be feared, but almost peripheral. ‘The war will end’ the children are told, ‘be patient.’ While they survive from day-to-day, as child victims of warfare always have, and continue to do so in the Syria migration and beyond. The summer of 1944, and following the Warsaw Uprising, the city falls to the Soviets. But more significantly, Bronia and Ruth find a pale and ragged boy lying on a heap of rubble. The kitten has gone, he now has a fiercely-protective cockerel called Jimpy, but this is Jan, who has the silver sword safe in his precious wooden box. As a child of the immediate post-war years I was bored and resentful of the reverence and force-fed respect I was expected to pay to the sacrifices and heroisms of events that had occurred before I was born, the fabricated swell of patriotism for ‘The Dam-Busters’ (1955) or ‘Reach For The Sky’ (1956), and the gratitude to aging icons Winston Churchill and Field Marshal Montgomery for saving our freedom. There were war-stories in the comics I read – Frank S Pepper’s long-running ‘Rockfist Rogan’, or air-ace ‘Paddy Payne’ on the cover of ‘Lion’, ‘Commando One’ or ‘War Eagle’ in ‘Comet’ where bull-necked Nazis exclaim ‘Gott in Himmel’, ‘Dummkopf’ and ‘Das Englander’. But I always preferred the fantasy or Sci-fi strips, or the Vikings and Roman epics. ‘The Silver Sword’ was different. This is no comic-strip heroism, it’s a human story. 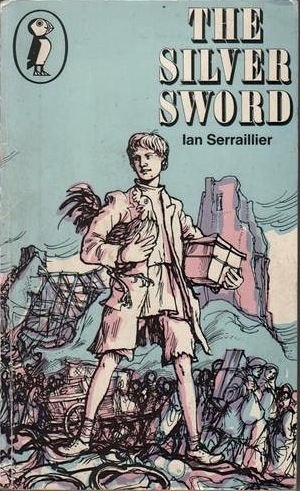 ‘War does strange things to young people’ writes Serraillier, and the enigmatic pickpocket Jan provides the perfect focus. Traumatised and damaged, yet fiercely resilient, he trusts, and has an affinity only with animals. 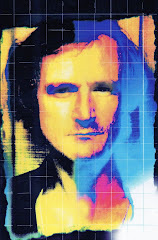 An alienated outsider, surly, sullen and uncommunicative, he’s needy, yet wary. The Russian Ivan assists Ruth’s school with food and writing materials, and helps trace lost brother Edek to the Posen transit camp. Yet to Jan, all soldiers are to be hated, whether Nazi or Russian ‘they’re all the same’. And it’s in a tussle with Ivan that the contents of Jan’s box are revealed – and Ruth recognises the silver sword. Birds make their nests among the ruins. For there are no trees left now, as Ruth and Bronia – with Jan, leave Warsaw to begin their long journey towards their Swiss ‘Promised Land’, via Posen. But Edek is no longer there. He’s escaped. Instead, they meet him by accident in the same Kolina soup-kitchen that poor Jimpy’s neck is broken in the crush for food. 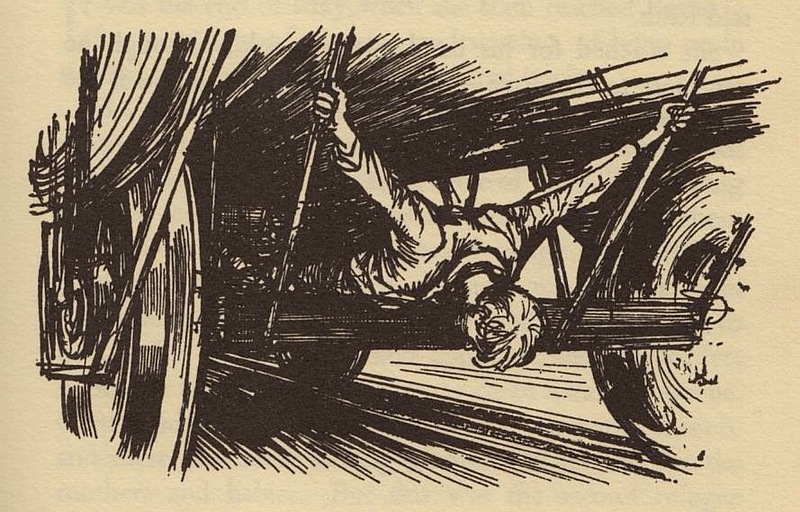 But this is a thinner, sicker Edek, who relates his tale of escaping German slave-labour by hanging suspended and freezing beneath the carriage of a speeding train. They reach the lunar landscape ruins of Berlin on a refugee train, and Jan adopts a new animal companion – Bistro, an escaped zoo chimpanzee with a taste for cigarettes. They cross the Elbe, watching the Red Army columns descend upon ‘towns littered with the debris of war, upon a people numbed by defeat, living from day to day, with no thought for the future’ (descriptions based on eye-witness accounts in J Stransky’s ‘Wind Over Prague’). And across into the US zone where Jan works a scam to switch rail-signals to red, halting the goods train long enough to plunder it. The narrative is straightforward, delivered in bite-size chapters. Except for the section in the form of a letter from English Army Officer Mark, to his wife Jane, describing his encounter with the ‘family’. And another from the point of view of Captain Greenwood of the US Army of Occupation, as he attempts to resolve the train-theft incident. Individuals are largely decent and well-intentioned, while overwhelmed by the humanitarian disaster that’s inflicting the devastated kleptocratic continent. From the Bavarian farmer who helps them and conceals them from a Burgomaster intent on repatriating them to Poland, to Joe Wolski, the jovial Polish-American GI who drives them towards the Swiss border. First published in 1956, perhaps the atrocity inflicted by the Red Army’s block-by-block advance through Berlin was not widely recognised at the time. Or perhaps Serraillier’s vision also carries it’s own truth. Born on 24 September 1912, the oldest of four children, he was educated at Brighton College and St Edmund Hall, Oxford. He was also a Quaker and an activist with the pacifist ‘Peace Pledge Union’. 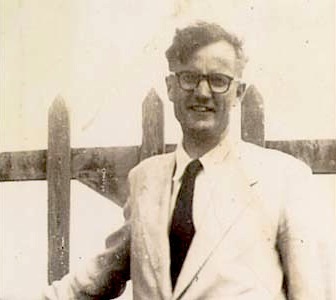 An anti-war commitment recognised by a November 1940 tribunal, granting him conscientious objector status enabling him to contribute to the war effort through school-teaching. 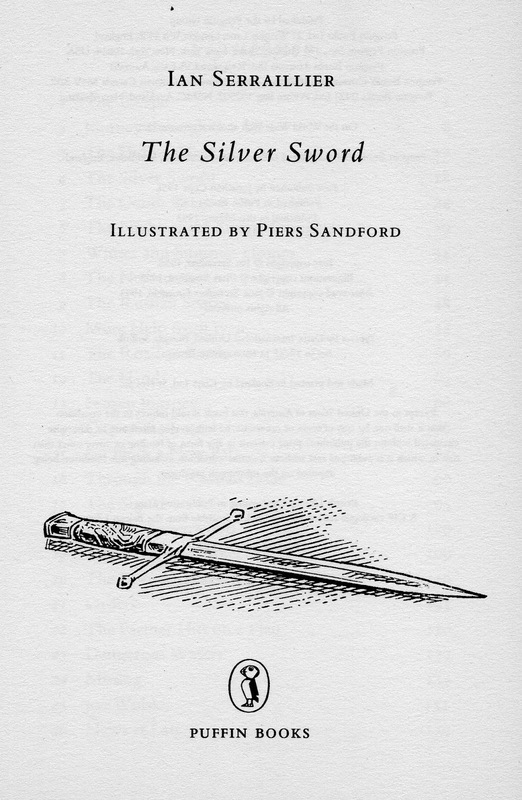 Written on an old Remington typewriter in his study across five long summer holidays, ‘The Silver Sword’ first appeared in a Jonathan Cape hardback with dust-jacket art by C Walter Hodges – the edition I originally owned. But it was a slow-burner, accelerated by the positive reception given to the BBC TV serial. In truth, there were only two channels. 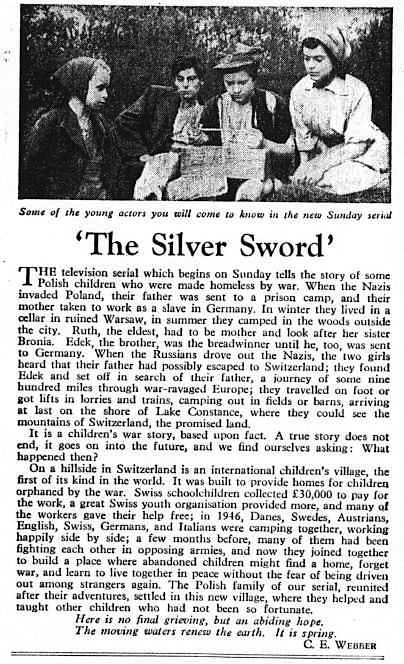 Up against the fledgling and still-patchy ITV network, the Sunday evening slot – later occupied by the five-part ‘Stranger On The Shore’ serial (from 21 September 1961), guaranteed mass juvenile audiences, and constituted something of a generational rite of passage. It was redone again by the BBC in eight episodes, from 22 August 1971. 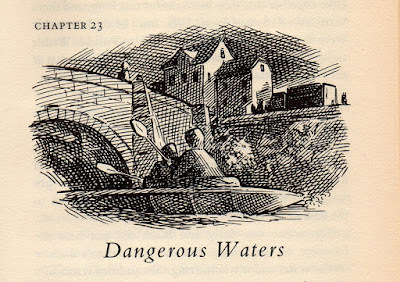 I clearly recall the black-and-white TV sequences dramatising Chapter 22, ‘The Farmer Hits On A Plan’, and Chapter 23, ‘Dangerous Waters’, as the four children use two ancient canoes to navigate the Falken River down to its junction with the Danube at Falkenburg. 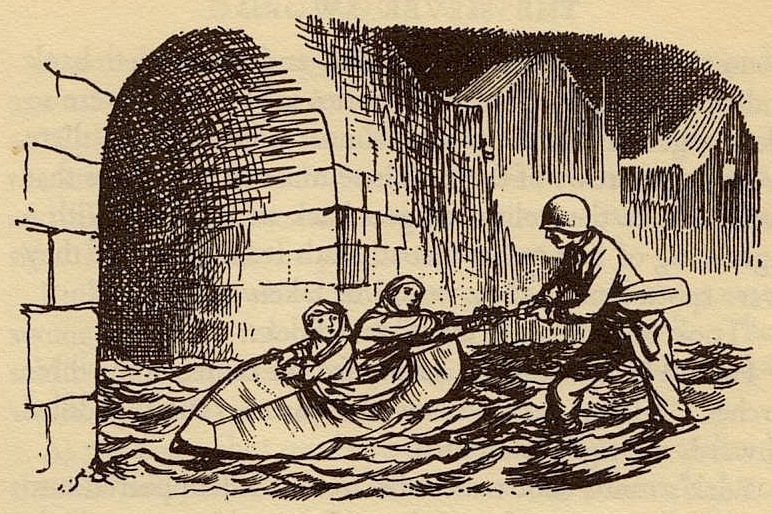 Ruth losing control of the canoe she shares with Bronia as they pass beneath the bridge-span, and shots being fired at them from the night as the current grips them and surges them forward. Then the final torrential storm that threatens to smash their venture into tragedy on Lake Constance, which forms the border to Switzerland itself. Jan rising to the occasion, retaining the silver sword, but sacrificing his precious box to the waves in his striving to save them. A decisive act of commitment binding him to his new-found family. To his daughter, Jane Serraillier Grossfeld, the book ‘is about the triumph of hope over despair’. In a ‘Peace News’ retrospective, poet Jeff Cloves observes that it ‘insists the best human values can never be extinguished by the worst. Ian Serraillier’s children are believable, their adventures not too far-fetched and their inevitable recovery of their parents will bring a lump to the throat of any reader – no matter how hard-hearted and unsentimental’ (www.peacenews.info/node/5803/triumph-will ). 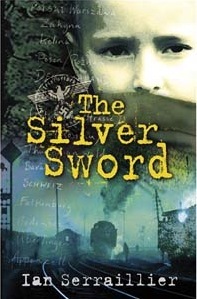 Although a work of fiction, ‘The Silver Sword’ was rigorously researched and includes strands of the authentic. He used photo-spreads from ‘Picture Post’ and news-accounts in the Quaker periodical ‘The Friend’, as well as official Unesco publications as reference points, sellotaped into his large hardback school notebook. As a young man he’d also canoed on the Danube, and his first teaching post was at an international school on Lake Geneva. 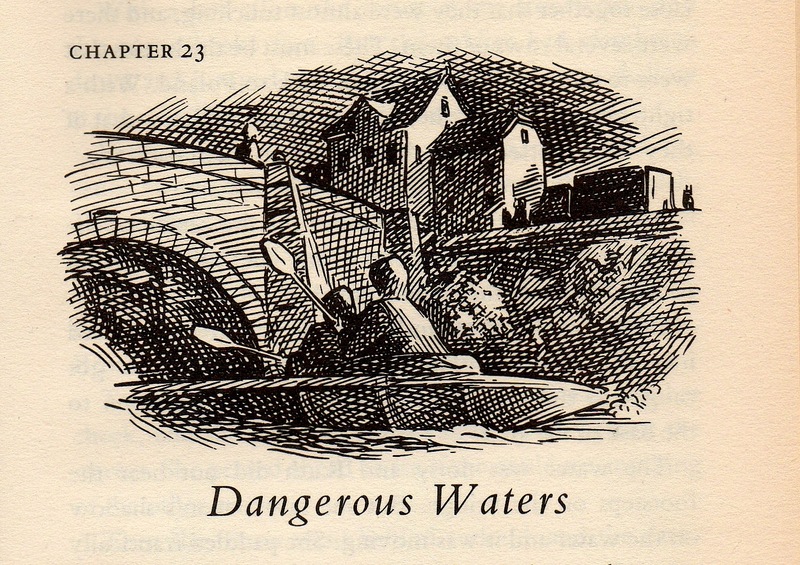 The characters are underscored by Red Cross records and, as Jane Serraillier Grossfeld points out in her essay appendaged to the Puffin Modern Classic edition, the real Edek did not survive the tuberculosis that was the legacy of his escape from German-slavery. And there’s nothing as patronizingly simple as a clear-cut happy ending. The delinquent and disturbed Jan – ‘that charming bundle of good intentions and atrocious deeds,’ finds difficulty adapting to peacetime, his psychic scars healed by working with animals. Ruth, forced into premature adult responsibility beyond her years, clings to her Mother. But they add their talents to the creation of the real-life Pestalozzi war-orphans village in Switzerland. Warsaw was full of lost children. Four of those lost children, removed from parental control and thrown back onto their own resources, cross war-devastated Europe. 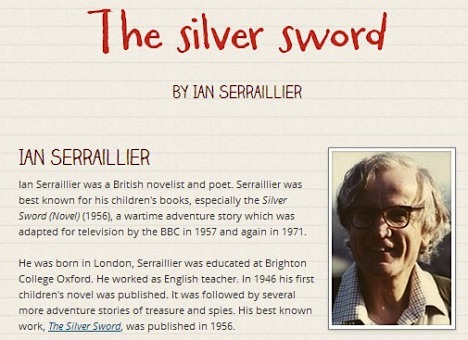 Ian Serraillier wrote other books, poems, and retellings of classic folklore and myth, including ‘The Ivory Horn’ (1960) – his versions of the Frankish ‘Roland’ legend, ‘Beowulf’ and the tales of Chaucer. He also co-founded Heinemann’s ‘New Windmill Series’ of children’s book with his wife Anne Margaret Rogers. But, although he died 28 November 1994, ‘The Silver Sword’ is the work into which he most engagingly pours his beliefs, and the book for which he’ll be long remembered.